A Thai con man has been detained by Thai police after the exposure and collapse of his fake permanent visa scam. The case highlights the acute vulnerability of foreigners in Thailand when doubts emerge about their ability to properly renew visas or keep all immigration affairs in perfect order. Immigration Police boss Major General Surachate Haparn interviews 50 year old Thai con man Pairoj Kanchanarat who was arrested by Thai police recently on foot of seven arrest warrants for immigration visa fraud. A foreigner living in Thailand has recently ended up in a Thai jail after being found to be in possession of a fake visas which was forged into his passport by another con artist. 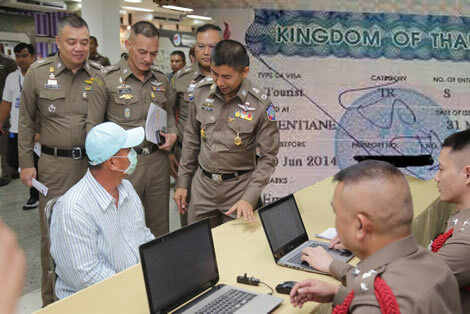 Given the rigorous enforcement of Thailand’s immigration laws by Thai authorities, it is now good advice to all foreigners both living in Thailand and those contemplating living in the kingdom, to get on top of all immigration requirements even if it means hiring a reputable professional to help prepare the paperwork and documentation. But be warned, there are no easy routes or quick fix solutions. Pairoj Kanchanarat, a 50-year-old Thai man who had been cheating foreign tourists into buying fake visas, was detained and taken into police custody, Immigration Bureau commissioner, Police Major General Surachate Hakparn told a press conference in Bangkok. For the last 10 years, Pairoj’s had deceived a lot of eager foreigners who found themselves in need of an informal and convenient way to obtain a permanent visa and work permit without showing up at Thai government offices or producing the required documentation. The paperwork and red tape associated with visa renewal and immigration procedures in Thailand can be daunting. Many foreigners in Thailand find the paperwork intensive visa process unwieldy and demanding. Elderly foreigners or those with limited means are particularly vulnerable. Thailand’s immigration policies in the last few years emphasise the need to fully implement conditions and the need to remove undesirable foreigners from the country in the interest of security. This includes foreigners with limited means, which at one point saw a surge in disconcerting reports of western foreigners begging in the streets of Thailand or living homeless on the streets. Police reports said Pairoj usually went to tourist attractions, befriending trusting travelers and falsely telling them that he had connections that could swiftly get them a permanent visa for between Bt20,000 and Bt 50,000. The seasoned conman’s downfall came after an angry US victim who, along with his Italian friend, paid Pairoj nearly 50,000 baht in total for his dubious services. The western duo got nothing in return and filed a complaint against him with the Thai police. Nevertheless, Pairoj evaded arrest and became quite accomplished in this art also. When eventually apprehended, it emerged that he was wanted on foot of seven separate fraud arrest warrants. Forging visas to extend the duration of a holders’ stay is a lucrative business in Thailand. The crime regularly lands western foreigners in hot water with Thai authorities. An Irish teaching couple were locked up in 2014 for an extended period when a language school they were working for used forgery to extend their visas unbeknownst to them. The boss of the agency later admitted his crime. Only then were the coupled released from Thai prison. The admission of guilt by their employer only came about after their families in Ireland asked notable individuals in the Irish community in Bangkok to intervene on their behalf. Unfortunately there are many foreigners who wish to stay in Thailand for the wrong reasons. Thai police have recently identified a patterns with foreigners from Africa who arrive into Thailand on short term tourist visas. Because of Thailand’s strict laws protecting the livelihood of Thai citizens many of these new arrivals resort to criminal operations. In the normal course of events they are also barred from obtaining a visa by genuine methods and therefore resort to the booming fake visa industry. One of the most popular forms of acquiring fake visas, it has emerged, is pretending to attend language schools in the country. Thai police have discovered that some of these schools are non-existent while others are authentic educational institutions that are, in fact, complicit in the scam. The magnitude of the visa forgery problems has prompted the Thai government to take strong measures. This is in addition to its ongoing security enhancement programme driven by police and the military since the military government came to power in 2014. Code named the ‘X-Ray Outlaw Foreigner’ operation, the extended operation that has cracked down on illegal foreigners. Thousands have been arrested in ongoing sweeps not just in key urban centres but now extended throughout Thailand. Thai police are now taking action in relation to the particular problem with visas being issued to students of English schools in Thailand. The ongoing police operation has seen thousands of foreigners arrested since it began a number of years ago. Many of them are foreigners from Africa and particular concern have been raised by the Thai police in relation to the number of Nigerian and Kenyan foreigners who have been found to be linked to elaborate romance scams targeting social networks and dating sites in Thailand. In the last year, the extent of these operations has even taken the police by surprise. The police are believed to be seeking discussions with the Thai Ministry of Education to change regulations and tighten controls on language schools. There have even been reports of some schools breaking the law and assisting foreigners to evade Thai Immigration regulations. A surprisingly large number of perpetrators are found to come from African countries like Nigeria, Ghana and Sierra Leone. However, people of other nationalities have also been implicated fin scams and misfortune for visa issues. For example, 10 Indian workers were arrested some weeks ago for overstaying their visa. But the threat of visa fraud should concern all foreign travelers who often, sadly have little understanding of the visa process in Thailand nadn quite easily become mired in trouble and even criminal proceeding which is not fake at all and has very real consequences. Thailand, unlike some western countries, is a country where immigration law is take very seriously. Thai travel forums are full of accounts featuring hapless foreigners in Thailand being detained in Immigration Detention Centres after being detected is phony visas. It’s always the same story. They have entrusted a supposed agent to take care of that job. In that respect, it should be noted by any foreigner interested in living in Thailand for an extended stay that no agent is licenced to obtain a visa from outside the country on behalf of a visa holder. There are reputable attorneys in Thailand who will assist and prepare documentation for foreigners and vene furnish the documentation for a foreigner visiting a Thai embassy or consulate in any part of the world. This is legitimate activity at the advisor is helping the client to comply with Thailand’s immigration code. The penalty for immigration offence sin Thailand can be severe. It can result in those found in breach even inadvertently being jailed and in most cases, results in a high fine and deportation from Thailand. In addition to this there is no automatic blacklisting for foreigners to Thailand from reentering the country for considerable periods of time. Earlier this year the Thai authorities were reported to be interesting in strengthening biometric testing including eye scanning and fingerprints linked to large databases being held and enhanced by the Thai government. The Thai government is committed to a ‘Big Data’ strategy into the future for enhancing the country’s security, empowering Thai citizens and wiping out corruption in the country. There is an acknowledgement of the need to strengthen border controls as the rolling campaign against illegal foreigners in Thailand and those committing crimes is ramped up. This campaign has in fact not only confirmed the extent of the problem but surprised officials involved as to the magnitude of the threra and the particular involvement of African crime gangs. Even as it stands, Thai police now regularly collect fingerprint samples as a matter of course form arrests across the country targeting all urban areas and sending the results to a central database in Bangkok. The extent of the problem for legitimate foreigners in Thailand is huge and the impact deeply personal. Many of the foreigners living in Thailand illegally are involved in crime. They regularly target legitimate foreigners and trusting members of the Thai public through elaborate and sophisticated internet scams involving investments, dating and illicit drugs. For one unfortunate foreigner the effect however was even more dramatic. Foreigners paid a fee to avoid the hassle and have his visa extended by Thai immigration. Big mistake. In the summer one foreigner seeking renewal of his visa was recommended by friends to a lawyer engaged in the business. He paid a fee and handed the man his passport which was returned with his visa renewed for a further one year. In most cases in Thailand, foreigners already living in the country are seeking a renewal of their visa, usually for one year. Two weeks after this, the man was confronted by Thai immigration police outside his condo on a happy sunny day in Thailand. It quickly turned very dark for the foreigner when police informed him that he as being arrested for having a fake documentation. His visa extension, it appeared, had been issued to another person legitimately two days prior to his receiving a similar stamp on his passport. The foreigner found himself initially in a Thai police station prison cell and then, to is utter consternation, he was transferred to Bangkok’s Klong Prem prison known infamously to most foreigners as the Bangkok Hilton. The unfortunate man ended up having to spend 56 days in the notorious Thai prison and was only released when he managed to raise the funds for bail. He is now facing prosecution and the prospect of further jail time for beaching Thailand’s immigration laws. His mood is still an anxious one as he currently is overstaying his visa and faces additional penalties for this. If the man is lucky, he will spend another few weeks in Thai prison, be deported back to his home country and be blacklisted from re entry into Thailand. If he is unlucky he is facing a longer and extended stay in the prison. This foreigner, who has lived in Thailand for a long time and never broken the law, is facing the prospect the his life in Thailand is over and he will be returned to his home country as a convicted criminal who has served time in Thai prison. In the case of the unfortunate western foreigner jailed in the Bangkok Hilton, it is probable that he is the victim of a fraud committed by forgery of an existing visa on his passport by unscrupulous individuals. The growing number foreigners coming to live in Thailand and the stringent nature of Thailand’s immigration system means that it must be an imperative cause of concern to all foreigner to have documentation fully in order while living in Thailand. Given the results and information emerging from the Thai police crackdown since 2014, it is easy to see why strict immigration provisions are necessary in Thailand. The extent to which many foreigners, evading proper immigration enforcement are linked to criminal activities, has increased the determination of Thai authorities to tighten the system further and to bolster screening on entry. For foreigners to Thailand it is essential to have proper and professional help to comply with immigration requirements and to avoid any doubt. Being in compliance with immigration provision is ultimately the first requirement for any foreigner seeking to live in Thailand.